WELCOME to the Official Blog of the 2013 National, November 17-23, 2013, held this year in Cheraw, South Carolina. 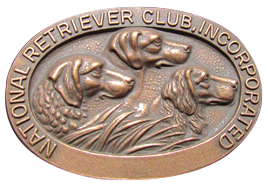 This year's Blog is brought to you by the Retriever News and sponsored by our Official Sponsors Purina and Avery and our other Sponsors Ainley, Move the Dog Transportation and YBS Media. We hope you enjoy these multi-daily updates and please come back often! This year we encourage visitors to participate in the National Open discussion located in the comments section of each post. These areas are a great outlet for remote communication and commentary for those unable to attend this year's NRC. Also, please keep an eye out for trivia, surveys and other interactive activities! SR: entered the water with a big splash, traveled a direct line to the bird. LR: traveled a good initial line, squared the pond, traveled up the hill behind the holding blind to the road and immediately turned back down the hill to retrieve the bird.